Born on July 29, 1820, in New Lisbon, Ohio. Vallandigham spent most of his youth at home, receiving an education from his father who was a Presbyterian minister. At seventeen years of age, Vallandigham briefly attended Jefferson College in Pennsylvania, but he did not graduate. 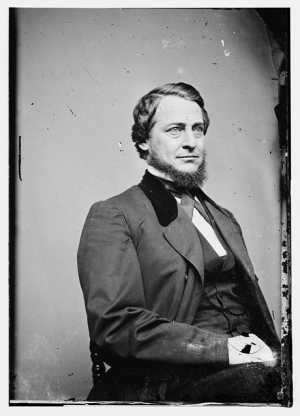 During the American Civil War, United States of America House of Representatives member Clement Vallandigham was a leader in the Copperhead movement. Born on July 29, 1820, in New Lisbon, Ohio. Vallandigham spent most of his youth at home, receiving an education from his father who was a Presbyterian minister. At seventeen years of age, Vallandigham briefly attended Jefferson College in Pennsylvania, but he did not graduate. Vallandigham left Jefferson College in 1838, and became a teacher at a private school in Maryland. He held this position for two years and then returned to Jefferson College. In 1840, the same year that he re-enrolled at Jefferson College, he left this institution and began to study the law on his own. His reasons for leaving Jefferson this second time remain unclear. In 1842, he successfully completed the Ohio bar exam and became a practicing attorney. Vallandigham quickly embarked upon a career in politics, serving in the Ohio General Assembly from Columbiana County in 1845. A member of the Democratic Party, Vallandigham remained in the General Assembly for only one term, choosing to move to Dayton, Ohio, where he found employment as the editor of a Democratic-leaning newspaper. In 1851, he unsuccessfully sought the Democratic Party's nomination for Ohio's lieutenant governor's office. In 1852 and 1854, Vallandigham campaigned against Lewis Campbell for a seat in the United States House of Representatives. Representing the Fusion Party, Campbell defeated Vallandigham in both races. In 1856, Vallandigham again challenged the incumbent Campbell. Initially, officials declared Campbell the winner by just nineteen votes, but in a subsequent recount, Vallandigham won the election by a mere twenty-three votes. The two men faced each other again in 1858, with Vallandigham winning by 188 votes. In 1858, Vallandigham won reelection against Campbell by 188 votes, and in 1860, he won by 134 votes over the Republican Party's candidate. After Vallandigham's victories, the Republican-controlled Ohio legislature redrew Vallandigham's district in 1861. When Vallandigham sought reelection in 1862, Republican military hero Robert Schenck defeated him by nearly 1,250 votes. As the American Civil War approached, Vallandigham called for compromise between the North and the South and even endorsed allowing the South to secede from the United States of America. To Vallandigham, violence was not a viable solution to the differences between the two regions. Despite these views, Vallandigham won reelection to the House of Representatives in 1860—albeit by just 134 votes—over his Republican opponent. In 1861, unhappy with Vallandigham's views, Republicans in the Ohio legislature redrew the boundaries of Vallandigham's district, securing the election in 1862 for Robert Schenck, a military hero and member of the Republican Party. Schenck won the election by approximately 1,250 votes. Seeking additional supporters for their cause, Peace Democrats continued to hold rallies in Ohio. One such rally occurred on May 1, 1863 in Mount Vernon, Ohio. At this gathering, Ohio's leading Peace Democrats, including Vallandigham, urged attendees to denounce the Union war effort and to protest against General Order No. 38. In reference to the order, Vallandigham purportedly stated that he "despised it, spit upon it, trampled it under his feet." At least two Union officers attended the rally, and they quickly informed General Burnside of Vallandigham's statements. Burnside immediately dispatched soldiers to arrest the Copperhead. The men apprehended Vallandigham in Dayton, Ohio, this Peace Democrat's home city. Authorities transported him to Cincinnati, Ohio, where Burnside's headquarters was located and where Vallandigham would stand trial before a military tribunal. Throughout the trial, the Peace Democrat and his attorney, George Pugh, never denied that Vallandigham had violated General Order No. 38. Instead, the two men claimed that the military tribunal did not have jurisdiction in this case. The military court rejected the defendant's arguments, finding Vallandigham guilty and sentencing him to federal prison until the Civil War's conclusion. Vallandigham attempted to appeal the ruling in United States Circuit Court, but the presiding judge, Humphrey Leavitt, ruled in favor of the military, stating that, during times of war and civil unrest, that the federal government could legally expand its powers to ensure victory. Fortunately for Vallandigham, President Abraham Lincoln commuted the Peace Democrat's sentence. Rather than imprisoning Vallandigham, Lincoln ordered him to live in exile in the Confederacy. Military authorities escorted Vallandigham to Confederate lines on May 25, 1863, carrying out President Lincoln's decision. Vallandigham only remained in the Confederate States of America for a short time period, moving to Canada in June 1863. In Canada, Vallandigham ran for election as Ohio's governor, but he was easily defeated by Unionist Party candidate John Brough. In violation of his punishment, Vallandigham returned to the North, settling in Ohio, in early 1864. Upon returning to Ohio, Vallandigham became the supreme commander of the Order of American Knights, which was also known as the Sons of Liberty. The Sons of Liberty were a more radical group of Peace Democrats. They sought to hamper the Northern war effort by any means possible, including utilizing violence. One Sons of Liberty plot involved freeing Southern inmates at the Union's Johnson's Island prison camp on Lake Erie. Sons of Liberty members hoped to capture the Michigan, a Northern gunboat operating on Lake Erie near Sandusky, Ohio. Using the ship, the plotters intended to sail to Johnson's Island and to rescue the Southern prisoners of war. These now released prisoners were to become the basis for a new Confederate army that would operate on Northern soil. Union spies infiltrated the Sons of Liberty, alerting Northern authorities to the plot. Officials arrested Charles Cole, the ringleader, before he could put his plan in motion. Vallandigham remained active in politics for the remainder of his life. Upon the Civil War's conclusion, he became one of Ohio's most prominent Democrats, including serving as the Ohio Democratic Party's Convention's chairman in 1865. Fearing that the Democratic Party would collapse over the slavery issue, he implored his fellow Democrats to support the Thirteenth and Fourteenth Amendments to the United States Constitution, which granted African Americans their freedom and equal protection under the law. Vallandigham believed that the only way the Democratic Party, principally a party of Southerners at this time, could survive and rival its Republican adversary was to reach out to Northerners, who increasingly favored opportunities and rights for African Americans. Vallandigham died at just fifty years of age on June 17, 1871. He accidently shot himself in a court of law. Vallandigham was serving as the defense attorney for a man accused of murder. While reenacting the crime, Vallandigham, not realizing that the gun was loaded, pulled the trigger on a prop weapon, mortally wounding himself. His body is interred in Woodland Cemetery in Dayton, Ohio.